It is that time of the year again. The leaves are changing, the temperature is lowering, and the smell of fresh-cooked home meals wisps through the air. Thanksgiving is now approaching, and the signs are all here as both natures’ changes and human decorum begin to reflect the approaching holidays. The time for giving is at hand, but the Thanksgiving that Americans know today is not the same one the pilgrims enjoyed many years ago. In fact, what many perceive as the first Thanksgiving may not have happened the way it did. Thanksgiving is remembered as a time when Native Americans and the Pilgrims first sat down and ate together in a display of gratitude for the bountiful harvest. This is the idea that most people have learned since grade school. However, this idea may be a bit skewed, and the Thanksgiving Americans celebrate is in no way like that of their forefathers. First is food. The primary notion of the Thanksgiving feast is the thought of a plump turkey and pumpkin pie gathered together on a table. These contemporary niceties are a far cry from what the actual Thanksgiving was, however. “The food that pilgrims ate back then was not like what we eat today. Pumpkin pie, for example, consisted of grounding up the fruit and making it into a pie. Such techniques were usually used for pig food,” Paul Kochanasz, a Social Studies and History teacher at Fleetwood Area High School, said. Kochanasz also said that, instead of mashing it up, they would instead take section of the pumpkin and bake it into the pie itself, such as how apple pie is made. “The early pilgrims probably didn’t eat turkey as well because wild turkeys were very hard to hunt,” Kochanasz said. Turkeys today are usually raised on farms with their wings clipped, so they cannot fly. They are then sold on a mass scale. “The Pilgrims and Indians likely would have eaten more readily available poultry like quail, dove, and maybe even duck or goose. They would have also have eaten more domesticated animals like pigs as well,” Kochanasz said. The Indians probably also brought hunted deer to the feast, as well and a slew of wild berries picked from nearby bushes. “The pilgrims would not have eaten raw vegetables because they were unclean. Instead, they almost always would have been eaten in stews,” Kochanasz said. When the Pilgrims first landed, they landed at an abandoned Patuxet Indian village, according to World Holidays Vol. 4. A vast majority of the native population had been wiped out by a plague, and the remaining natives, like the Wampanoag, who first made contact with the pilgrims with the help of Squanto, were now a shadow of their former selves. 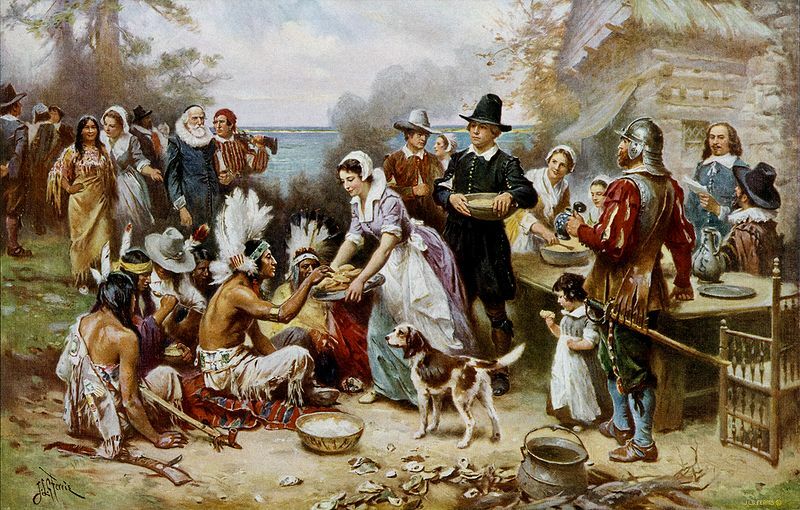 Aside from the food differences of today, there are the social standards that vary greatly from that of the pilgrims. “The main focus back then was on the joy of family and friends,” Mr. Yuengel said. Yuengel is also a social studies teacher at Fleetwood Area High School. “The focus of today, however, is much more incorporated and now centered around shopping and merchandise rather than family and friends,” Yuengel said. This is shown quite strongly in the amount of advertisements shown around this time of year, as well as events such as the Macy’s Thanksgiving Day parade, which in itself is one long, sponsored event. While many people today still celebrate Thanksgiving with their friends or family, the idea has drastically changed since the time of the Pilgrims, from not only the food to the social standards as well. Many also wonder how Thanksgiving may change in the future.